You are here: Home » How to Add Google Maps in a WordPress Site? 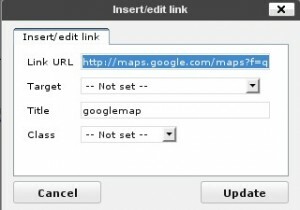 How to Add Google Maps in a WordPress Site? 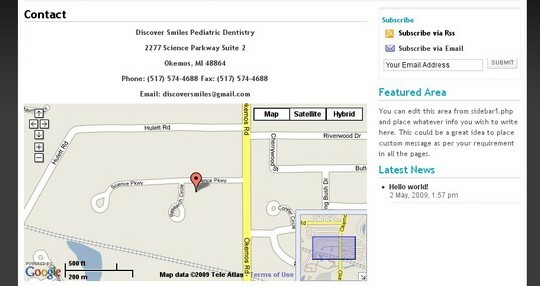 My wife was helping a friend with a website for their pediatric dentistry in Okemos. She wanted to insert a Google Maps location in their Contact page so anyone looking up their website can easily find directions to the office. Their website is running on WordPress and here’s how we added Google Maps to their website. Just note that these instructions are for self-hosted WordPress blogs only. Get a Google Maps API Key from here. It’s as easy as logging in with your Google account. Go to Plugin configuration page and enter the Google Maps API Key from step 1 and save it. You can adjust your Maps dimensions for your site here: it defaults to 500px by 300px. On the top-right corner, find the ‘Link’ button and copy the link there. You may have to play with this a little bit to get it right. Try generating links at various zoom level and check how it shows up in your website. Publish your page and you are done! Hope the above steps weren”t too hard to follow. Let me know in the comments if you have any questions. You can also add various options to the map via plugin parameters. Also check out Avi’s post linked at the bottom if you are looking to add more bubbles, features to the map. Chris, great to see you again man! I almost didn’t recognize you but your email clued me in. 🙂 Hope you are keeping well. Thank you so much for this post, after working my way through 3 other plugins I was getting very frustrated with not being able to get the googlemaps working, but now I feel much better! Thank you so much for this post, after working my way through 3 other plugins I was getting very frustrated with not being able to get the google maps working, but now I feel much better! There may be a way to do that. I will update the post if I find it.